Price is the strongest lever a business has to affect its bottom line. Yet, pricing remains the least used, and most ignored of the 4 P’s of marketing. Now, with this new eBook available as a PDF as well as an iBook for the iPad, businesses can learn simple but powerful ways to use readily available data and make smart pricing decisions. Using examples from both manufacturing as well as services industries, the book reveals techniques that can help any business decide on whether to raise or lower prices for higher profits. 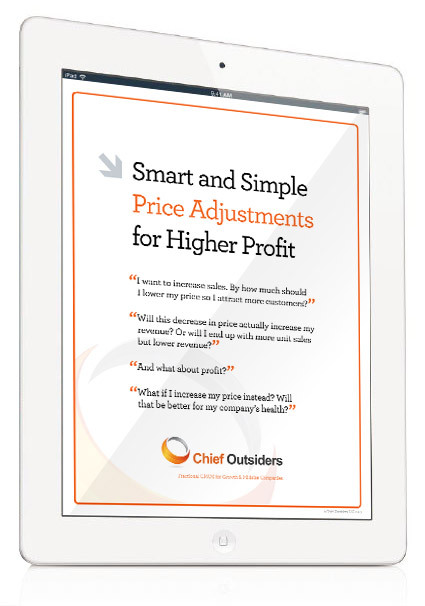 Register now for Atul Minocha’s eBook “Smart and Simple Price Adjustments for Higher Profit”. Feel free to contact Atul directly at AMinocha@ChiefOutsiders.com if you have any questions or want to discuss your company-specific pricing issues.